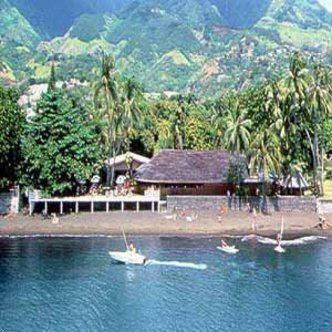 The Hotel is situated in spacious gardens along the lovely lagoon facing the Island of Moorea. The guest rooms are spacious, with queen size or twin beds, with a first floor balcony and a ground floor terrace. Air conditioning, refridgerator, telephone, bath and shower, tea and coffee making facilities are available. For the sports lover, masks, snorkels, flippers, and canoes are free of charge. Other sports such as tennis, horse riding, and sailing, are within easy walking distance of the hotel. All of the guest rooms are comfortable and nicely equipped to give a feeling of being home while away from home. The hotel also has a variety of facilities and services that are sure to meet the needs of both business and leisure travellers.